Children are consuming images at an extraordinary rate and it is therefore imperative that they learn how to ‘read’ them and develop the skills of exploration, critique and reflection. Given the power of photos to influence and persuade, it is vital for children to become better “readers” and canny consumers of visual news and messaging. Visual literacy is what we see with the mind and not just our eyes. It is our ability to construct meaning from visual images. Visual literacy is the ability to find meaning in imagery. It involves a set of skills ranging from simple identification – naming what one sees – to complex interpretation on contextual, metaphoric and philosophical levels. Many aspects of cognition are called upon, such as personal association, questioning, speculating, analyzing, fact-finding, and categorizing. Being visually literate means being active, forensic and creative users of the visual language of images and teaching children how to interpret and create visual texts is an essential component of the English curriculum. How can we support pupils to decode images and understand the world around them? How can we develop their skills to distinguish between sensationalism and healthy journalism; between fact and fake; between evidence-based statements and empty noise? Visually literate learners are able to make judgements about the accuracy, validity and integrity of images but this is no easy task. It is a thoughtful and sustained form of understanding that requires some strategic planning and careful resourcing. News pictures are a rich-source of material for grabbing children’s attention and then exploring the events behind them, within them and around them. A picture is a starting point for helping develop critical thinking and for asking and answering the basic questions Who, What, Where, When, Why and How? Pictures communicate meaning and can be ‘read’ in the same way as written or printed text can be. Looking at a picture and what it says to us will depend on the opinions, beliefs and values we hold. What we see isn’t always what others will see and whilst the picture might represent a real-life story, there can be many stories wrapped inside that need bringing out. A visual is like a Babushka doll when you really start looking. Using images and combining them with talking and writing tasks is a sure-fire way to increase vocabulary, grammar, and narrative skills. You can find the images yourself or visit dedicated websites where there are lots of collections to tap into. One of my favourite go-to websites is www.onceuponapicture.co.uk run by Sam Daunt where you will find a whole pile of images to use for writing inspiration. The following picture is from the non-fiction or ‘faction’ collection and the questions show how they can instantly get children involved. It’s certainly a powerful and unusual image and the sort of thing that encourages plenty of thought, talk and writing with plenty of room for development, extension and challenge. Using these images involves intra-personal and meta-cognitive as well as inter-personal collaboration. 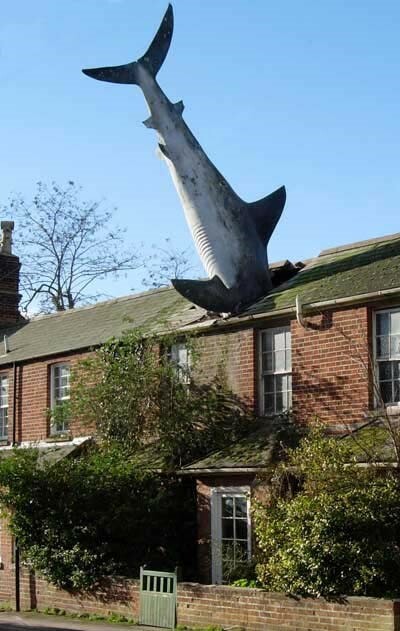 How did the shark get there? Was anyone in the house at the time? How did the residents of the street react? What happened to the shark in the end? Write a newspaper report about the arrival of The Headington Shark. Write a transcript of a police interview with a witness or the person responsible. Another must-visit website is the images shed of the marvellous The Literacy Shed website, at www.literacyshed.com/the-images-shed. Here you will find lots of inspiring images that can be used as writing prompts. From abandoned places and landscapes to flying houses and statues, the images are stunning and can prompt some seriously creative discussions and writing. Images and news photos are dynamic picture prompts and superb ways to develop narrative writing, personal writing, argumentative writing or expository writing. They contain information and ideas and allow the viewer to place them in context or invent their own as well as being critical consumers. Picture prompts can be productively used for making inferences or an educated guess as to what is going on. They can also inspire children to make some sort of personal connection and write from the perspective of one of the people, animals of things shown. 3) acquire, consolidate, communicate and transfer knowledge and understanding. It’s always a worthwhile activity to compare news stories and pictures by looking at different newspapers, magazines and websites – some are similar but others handle subjects and events differently. Pictures have a powerful way of shaping our perception of what has happened. Visually literate learners should be able to read and write visual language but this takes time and this is why regularly looking at pictures in the news can help children comprehend and appreciate the images created by others. To be an effective communicator in the 21st Century, learners need to be able to interpret, create and select images to express a range of meanings. Grasp the synergy, interaction, innovation, affective impact and/or ‘feel’ of an image. This is quite a list and somewhat of a tall order for any individual teacher to tackle alone but collectively teachers can use opportunities within different subjects to develop these skills and build visual literacy. Picture News can certainly play a key role in helping teachers support children communicate more effectively by teaching the basic principles of visual literacy. Using the photos in Picture News will enable children to develop a greater sophistication of understanding and move beyond the superficial to a higher order of visual literacy. Interacting with news pictures encourages children to critically investigate images and enhances their verbal and written literacy skills and vocabulary. ‘Getting the picture’ is a serious business but a fun one too and is best developed through contact with a varied menu of images fuelled by thoughtful and challenging questioning and discussion. Beaudry, J. (2014). Visual Literacy for Teaching and Learning: Essential Knowledge and Skills to Create, Use and Assess Concept Maps and Graphic Organizers. Yenawine, P. (1997) In Thoughts on Visual Literacy, , in J Flood, SB Heath, and D Lapp (Eds) Handbook of research on teaching literacy through the communicative and visual arts.